Bailey Boutries had a goal of catching two keepers today, but he far exceeded that by taking the day-2 lead at Grand Lake. After catching nearly 15 pounds on Thursday, Bailey Boutries set himself a pretty modest goal for today. 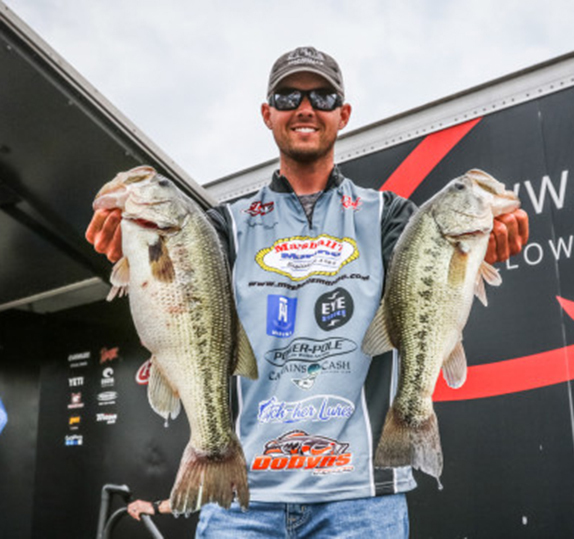 He figured catching two keepers would be enough to keep himself in range to cash a check at the Grand Lake FLW Tour. With as tough as the fishing has been, he was trying to be realistic, but more so he wanted to secure his first payday as a Tour pro. 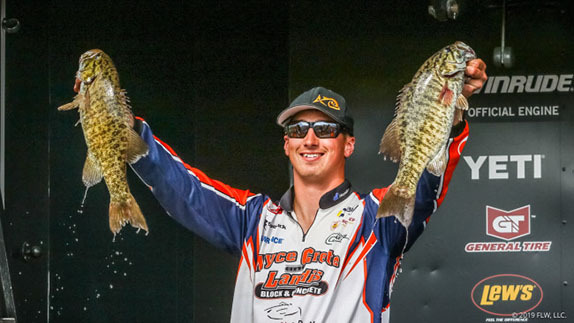 Two keepers turned into the 20-year-old rookie taking over the lead at the halfway point with his first 20-pound stringer in FLW competition. Boutries sacked 20-06 and heads into the weekend with a 35-04 total. His was one of three 20-pound bags caught today. John Cox backed up his 15-15 bag with 19-01 today and moved into 2nd with 35-00. Bradford Beavers bagged 15-15 and is an ounce behind Cox in 3rd. 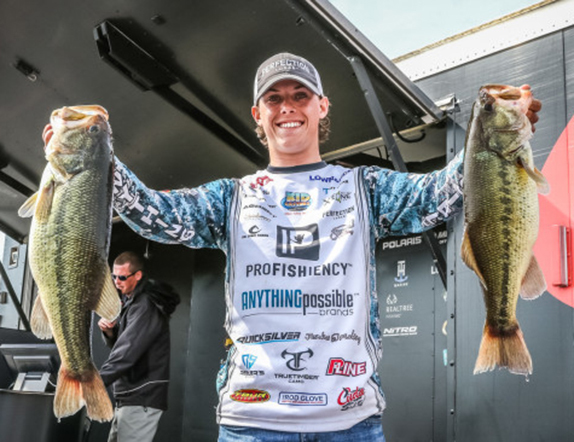 Jamie Horton hauled in 19-00 and moved up to 4th with 32-14, the same total as Bryan Thrift, who has bounced back from a miserable showing at Lake Seminole. Thrift caught 16-02 today and is the only competitor who’s caught 16 pounds or more both days. The anglers who occupied the top three spots on the leaderboard after day 1 all struggled today – all three managed just three keepers apiece – but still managed to make the top-30 cut. Kyle Weisenburger, the day-1 leader, slipped to 7th while Miles Burghoff dropped to 14th and Todd Castledine slid to 17th. Brian Latimer, the winner of the last Tour stop at Lake Seminole, caught the biggest bag of the day (21-12) and rocketed from 41st to 6th. Jon Canada jumped from 86th to 19th behind a 20-08 stringer a day after weighing two for 6-02. Points leader Terry Bolton had another solid day with 15-10 and made the cut in 10th with 31-08. There were 31 limits recorded today (37 were caught Thursday) and 26 anglers took zeroes. There were 108 competitors who caught three or fewer fish. Thirteen anglers who remain have caught limits both days. After a sunny start to the day, a violent thunderstorm that brought lightning, wind and steady rain moved into the Grove, Okla., area. Tomorrow, a cold front that will see daytime highs drop off by 20 degrees will arrive and possibly present a new set of challenges for the remaining 30 competitors. It’s widely believed, however, that the cold snap won’t deter the fish from continuing their pre-spawn migration toward the bank, setting up more predictable scenarios for the anglers. Those who are in the top 10 after tomorrow will advance to Sunday, when the winner will be determined by highest cumulative weight. Boutries, who turned 20 on March 17, wouldn’t mind sticking around an extra day. He thinks the warming trend that’s been in place since Monday has more fish on the move toward the bank and doesn’t believe tomorrow’s cooler weather will back them off. “They’re definitely not going to leave the places I’m catching them,” he added. 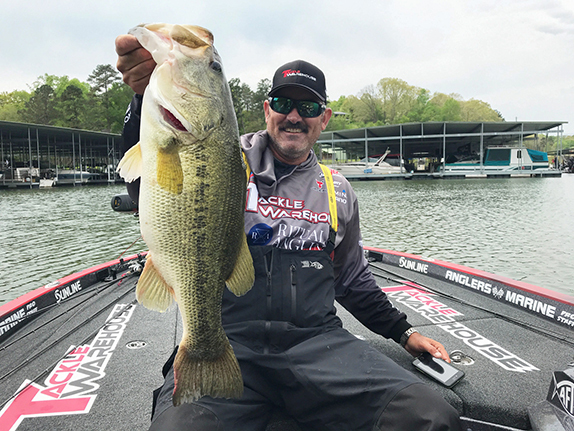 John Cox has made the most of the six keepers he's caught each day. 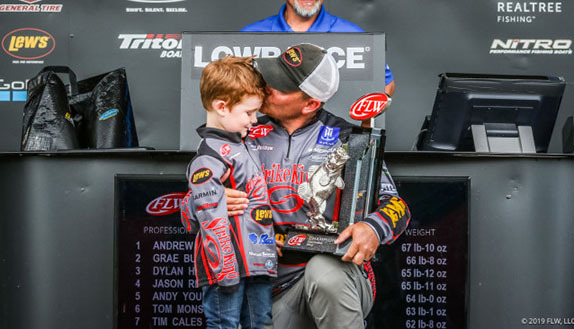 He described having his most success around “real shallow rock,” and he’s identified certain areas that seem to be harboring more and bigger fish. “I have a pattern I can run across the lake to catch them here and there, but today I narrowed it down to a certain area of the lake where I can catch better ones,” he said. After dragging soft plastics and cranking on day 1, he relied on a War Eagle spinnerbait using 17-pound P-Line Tactical fluorocarbon today. “Just reeling it real slow,” he said. 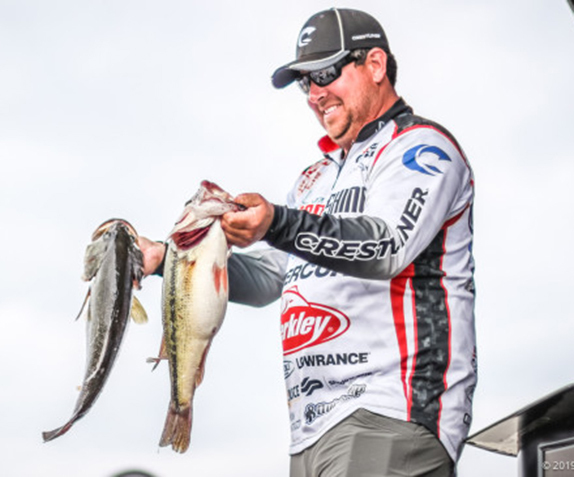 For the second day in a row, Cox boated just six bass and he’s not sure what to make of his chances this weekend. He’s been trying to target the skinniest water on the lake, but had to adjust today and made his second top-30 cut this season. After a 51st-place showing at Seminole, he’s happy to make the cut in Oklahoma. Beavers said he’s still getting used to the multi-day tournament format, but he’s now in position to make a second straight top-10 so it appears as if he’s adjusting just fine. He said the key so far has been milking one area of the lake where he had some bites in practice. Bradford Beavers has few expectations going into Saturday, but is pleased to have made the top-30 cut. He’s been targeting timber each day and got the same number of bites as he did Thursday. He’s going into Saturday with a neutral mindset. Like others near the top of the leaderboard, Horton has opted to expand on an area where he caught fish in practice. He caught two 4-pounders there on Thursday and left after sensing he may have fished it out. Feeling he had enough to collect a check, he made one more pass through it and landed two 4-pounders and a 5. He said the bite picked up during the thunderstorm, but said the fishing has been typical for the spring when the water temperature is in the mid 50s. On Saturday, he knows he’ll be go back to his productive area. Outside of that, he’s not sure where else to go. The following anglers missed the cut and will compete on day 3.